Just solved this one for myself. I've got a page (Hordeboloods) that for formatting reasons, I create in Dreamweaver, then copy the code to a Blogger post whenever I want to update it. Noticed an image that the browser would just open instead of displaying in the lightbox display. There are a few other differences. There's an imageanchor tag in the A link, the link and the image path had different paths, but changing these (even after I got it working) didn't change whether it worked or not. "When you are not testing them the backups are both there and not there at the same time." 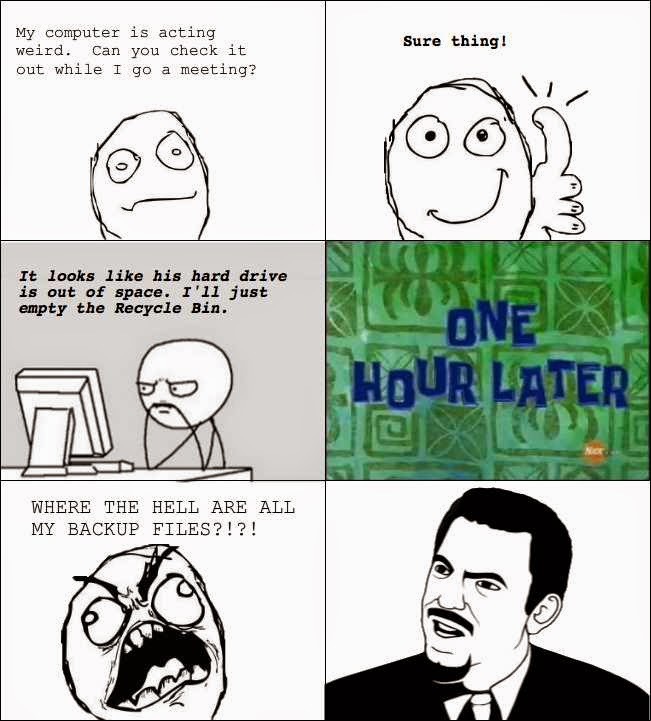 So, you're doing backups? Great. Do they work? Have you ever tested restoring even one? In this case, backup files physically exist, but without testing them, you don't really know if the backup is valid. Came across this over on FailDesk and my how it brought me back to an incident I dealt with / created once. We had issues with the Exchange server filling up and while users weren't bad about deleting large emails or backing them up to local PST's, they never emptied their Deleted Items. This led to full mailboxes and serious performance issues. So, that caused a bit of an incident. The user could not be convinced that storing emails in the trash was unwise. I believe I was able to restore the emails in question, but wow. Moving forward, I left the GPO in place and it solved a lot of email woes.